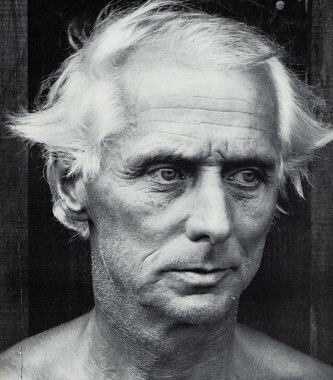 Max Ernst was born in Bruhl, a place near Cologne, in Germany. He was raised in a strict Catholic family, and both of his parents were disciplinarians who were dedicated to training their children into God-fearing and talented individuals. Although his father was deaf, Ernst learned so much from him, particularly when it comes to painting. In fact, much of his early years were lived under the inspiration of his father who was also a teacher. He was the one who introduced painting to Ernst at an early age. In 1914, Ernst attended the University of Bonn where he studied philosophy. However, he eventually dropped out of school because he was more interested in the arts. He claimed that his primary sources of interest included anything that had something to do with painting. Moreover, he became fascinated with psychology, among other subjects in school. Primarily, Ernst's love for painting was the main reason why he became deeply interested with this craft and decided to pursue it later on in his life. During his early years, he became familiar with the works of some of the greatest artists of all time including Claude Monet, Paul Cezanne and Vincent van Gogh. He was also drawn to themes such as fantasy and dream imagery, which were among the common subjects of the works of Giorgio de Chirico. During World War I, Ernst was forced to join the German Army, and he became a part of the artillery division that exposed him greatly to the drama of warfare. A soldier in the War, Ernst emerged deeply traumatized and highly critical of western culture. These charged sentiments directly fed into his vision of the modern world as irrational, an idea that became the basis of his artwork. Ernst's artistic vision, along with his humor and verve come through strongly in his Dada and Surrealists works; Ernst was a pioneer of both movements. It was Ernst's memories of the war and his childhood that helps him create absurd, yet interesting scenes in his artworks. Soon, he took his passion for the arts seriously when he returned to Germany after the war. With Jean Arp, a poet and artist, Ernst formed a group for artists in Cologne. He also developed a close relationship with fellow artists in Paris who propagated Avant-Garde artworks. In 1919, Ernst started creating some of his first collages, where he made use of various materials including illustrated catalogs and some manuals that produced a somewhat futuristic image. 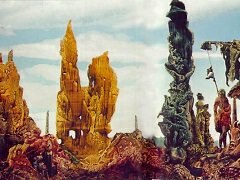 His unique masterpieces allowed Ernst to create his very own world of dreams and fantasy, which eventually helped heal his personal issues and trauma. In addition to painting and creating collages, Ernst also edited some journals. He also made a few sculptures that were rather queer in appearance. In 1920s, influenced by the writings of psychologist Sigmund Freud, the literary, intellectual, and artistic movement called Surrealism sought a revolution against the constraints of the rational mind; and by extension, they saw the rules of a society as oppressive. Surrealism also embraces a Marxist ideology that demands an orthodox approach to history as a product of the material interaction of collective interests, and many renown Surrealism artists later on became 20th century Counterculture symbols such as Marxist Che Guevara. In 1922 Ernst moved to Paris, where the surrealists were gathering around Andre Breton. 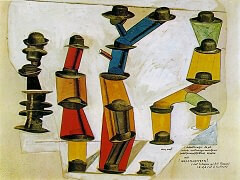 In 1923 Ernst finished Men Shall Know Nothing of This, known as the first Surrealist painting. Ernst was one of the first artists who apply The Interpretation of Dreams by Freud to investigate his deep psyche in order to explore the source of his own creativity. While turning inwards unto himself, Ernst was also tapping into the universal unconscious with its common dream imagery. Despite his strange styles, Ernst gained quite a reputation that earned him some followers throughout his life. He even helped shape the trend of American art during the mid-century, thanks to his brilliant and extraordinary ideas that were unlike those of other artists during his time. Ernst also became friends with Peggy Guggenheim, which inspired him to develop close ties with the abstract expressionists. When Ernst lived in Sedona, he became deeply fascinated with the Southwest Native American navajo art. In fact, the technique used in this artwork inspired him and paved the way for him to create paintings that depicted this style. Thus, Ernst became a main figure of this art technique, including the rituals and spiritual traditions included in this form of art. Pollock, aside from the other younger generations of abstract expressionists, was also inspired by sand painting of the Southwest Native Americans. Meanwhile, Germany was completely under control by the Nazi Party during the year 1933. In 1937, Hitler was able to gather as much as 16,000 avant-garde artworks that were originally in display in the national museums of Germany. He also ordered to ship about 650 artworks to Munich in preparation for his art exhibition called the Degenerate Art or Degenerate Kunst. Works of many contemporary artist such as Wassily Kandinsky, Marc Chagall, Paul Klee, and Piet Mondrian are included in the exhibition. In the said art exhibition, Ernst had about 2 paintings that were on display. However, these 2 artworks were reported to have disappeared, with the possibility of have been destroyed. Soon, Ernst decided to leave France and headed to New York to start a new life after becoming interned as a German national thrice. In New York, he joined Piet Mondrian and Marcel Duchamp, who were his fellow avant-garde artists from Europe. 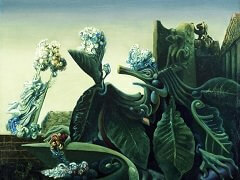 With these two artists, Ernst inspired a number of aspiring and professional American artists during that period. Furthermore, it was in the United States where he met the gallery owner and socialite named Peggy Guggenheim, who eventually became Ernst's third wife. It was Guggenheim who paved the way for Ernst to enter the bustling art scene in New York. What captivated American artists about Ernst's works was his evident rejection of conventional styles and imageries in painting. These techniques were largely gained from his father's own styles, which he refused to follow in his later works. As young American artists were more interested in fresh and novel approaches to painting, this Ernst's unique style captured the attention of painters who became exposed to his artworks. In particular, Jackson Pollock was enthralled upon seeing the extraordinary works of Ernst. Hence, the young artist became one of Ernst's followers, among a few others. 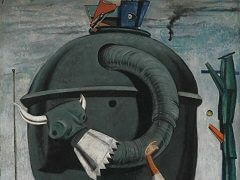 Specifically, it was Ernst's collage aspects in his paintings that fascinated those who viewed his masterpieces. Additionally, the German artist was able to encapsulate the unconscious with his experimentation with automatic writing and autonomism. In his later years, he divorced Guggenheim and married Dorothea Tanning, who was a surrealist painter based in Sedona, in Arizona. The couple soon moved to France, in 1953 and settled there. 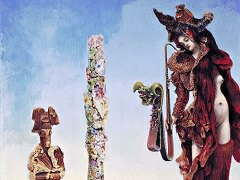 A year after, Ernst receive an award at the Venice Biennale, which was a prestigious awards contest. Ernst, alongside his wife Tanning, became very active as an artist. They toured to various places throughout the world to learn more about the different art techniques and inspired several artists who witnessed their unique pieces. Over the years there have been many artists associated with Surrealism which continues to exert its influence on art to this day. 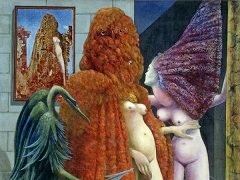 However, those major figures who were responsible for creating the golden age of Surrealism were Max Ernst, Joan Miro, Salvador Dali and Rene Magritte. In 1976, Ernst passed away, yet his legacy lived on as he continued to become a source of inspiration for artists throughout the world. Along with Dali's Persistence of Memory and The Son of Man, and Miro's The Tilled Field, Ernst's works The Elephant Celebes and The Barbarians have become the iconic images of Surrealism Movement. Copyright © 2010-Present www.Max-Ernst.com. All Rights Reserved.